Fathers day was yesterday, and it always gets me thinking about the role my husband plays in my children’s lives and the role my dad played in my own. I’m very lucky to have such a wonderful partner in parenting with my husband. We both take care of poopy bums. We both bathe the kids. We both do bedtime. We share chores like dishes and cleaning. My husband is not “Mr. Mom”, and he does not babysit our children. He is Dad. And we are partners. My dad was the same way. He was always active in my life as a parent, and when my mom went back to school full time, he cooked, cleaned, and took care of my brother and I while my mom was studying. She even moved away for a couple months for a practicum and my dad took on the role of single parent while she was gone. This week, I start my own adventure as I start online classes to get a Bachelors of Education. It is two years of full-time study online, so I will be juggling parenting throughout the day in addition to writing for work and studying for my degree. I would not be able to do all this if I didn’t have such a wonderfully supportive husband who was willing to take on the additional tasks of parenting while I am studying in the evenings and off on field study work for a couple of weeks over the next two years. Growing up with my father who was always happy to help around the home, and having a husband who is always willing to help, I think I have taken this for granted. I hear about husbands who do not help around the home, or do not want to help with diapers or bathing children. Hearing wives complaining makes me realize how lucky I have been to have been to have two such amazing men in my life who act as partners to their wives. Is my family perfect? Of course not. 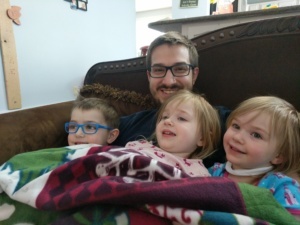 But, the fact that my husband tries really hard to support me and our children at home after working very hard at his own stressful job during the day makes him a rock star in my eyes. I’m not sure what the future will hold for my family over the next two years. I’m lucky enough that I can do this program online and still be home to watch my kids during the day. But. It is nice to know that my husband has my back while I’m studying and trying to finish projects. So. Heres to the husbands who are partners to their wives. The men who are Dads. Not “Mr. Mom”, or babysitters. The super heroes and rock stars that are there for their wives and children whenever they are needed. Thanks for being there when we need you.